Orthosiphon stamineus Benth. (Lamiaceae) is a valued medicinal plant in traditional folk medicine. Many pharmacological studies have demonstrated the ability of this plant to exhibit antimicrobial, antioxidant, hepatoprotection, antigenotoxic, antiplasmodial, cytotoxic, cardioactive, antidiabetic, anti-inflammatory activies. 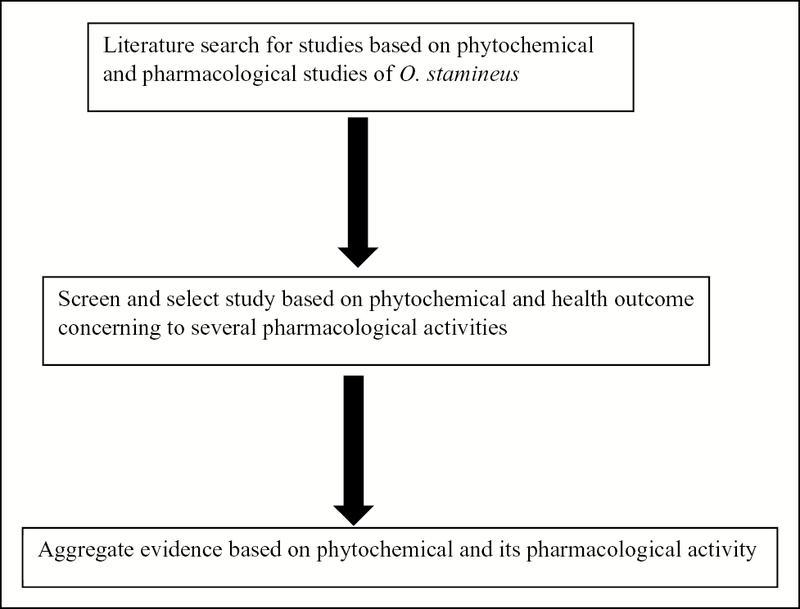 This review is a comprehensive summary of the presently available chemical, pharmacological investigations as well as the traditional and therapeutic uses of this plant. Important and different experimental data have been addressed along with a review of all phytochemicals identified in this plant, including flavonoids, terpenoids, and essential oils. O. stamineus has wide traditional and pharmacological uses in various pathophysiological conditions. Therefore, it is an attractive subject for further experimental and clinical investigations. Pain is an unpleasant subjective feeling having implications on both physical and mental realm. Multiple dimensions of pain involving behavioral, spiritual, emotional, and cognitive changes have been studied and pathways elucidated. It is stressed that the nature in which pain is modulated and perceived at a higher center is a complex phenomenon. One of the main goals of pain modulation is to modify pain to a more tolerable level, rather than its complete eradication. Different pain management interventions were tried but have effects that are more adverse. Till date, the only reliable pain blockers are analgesics and anti-inflammatory drugs in the form of opioids and non-opioids. Despite this, most of the drugs are ineffective at various levels, furthermore, adding to complications. Thus, there is an urgent need for effective intervention with minimal side effects. Ascorbic acid, popularly known as vitamin C, has shown to exhibit promising analgesic properties. The literature is sparse with the usage of the drug in various forms of pain. This review focuses on the dynamics and kinetics of vitamin C and its usage in various forms of pain. With minimal adverse effects, the drug is shown to perform well in different types of pain disorders, thus paving way for alternative interventional agent for pain management. Abuse of substances or methods to enhance the performance is becoming very common in the sports, which often destroys the spirit of competition. The regulatory bodies for sports have reported rates ranging from 5% to 31% for the use of performance-enhancing substances among athletes. Athletes can have serious injuries and morbidities, leading to poor health with the use of such substances. Commonly abused agents in sports include anabolic–androgenic steroids and its analogs, blood, erythropoietin, growth hormone and its derivatives, nutritional supplements, creatine, amphetamines, beta-hydroxy-beta-methylbutyrate (HMB), stimulants, and analgesics. Health-care professionals need to be careful while prescribing medicines to sportspersons. Knowledge of exercise physiology, pharmacology of the commonly used agents for sports-related injuries, and agents used for doping could help the sportspersons and health-care professionals to avoid the embarrassment arising because of misuse of these agents. Sports pharmacology includes study of the various aspects of the drug use and abuse in sports and treatment of sports-related injuries. Focusing on sports pharmacology in the medical curriculum can help the upcoming health-care professionals to support the sportspersons to improve the quality of their life by using various drugs and other substances within the standardized limits and avoid embarrassment of doping. Background: Plants of the Amaryllidaceae family have been under intense scrutiny for the presence of a couple of alkaloidal secondary metabolites with endued cytotoxic activity, such as pancratistatin (1), 7-deoxypancratistatin (2), narciclasine (3), 7-deoxynarciclasine (4), trans-dihydronarciclasine (5), and 7-deoxy-trans-dihydronarciclasine (6). Nevertheless, preclinical evaluation of these alkaloids has been put on hold because of the limited quantity of materials available from isolation. Aim: To explore the underlying cytotoxic molecular mechanisms of the Amaryllidaceae alkaloids (1–6) and to assess their absorption, distribution, metabolism, excretion, and toxicity (ADMET) profiles using chemoinformatic tools. Materials And Methods: AutoDock 4.0 software along with different in silico chemoinformatic tools, namely PharmMapper, Molinspiration, MetaPrint2D, and admetSAR servers, were used to assess the drugability of the Amaryllidaceae alkaloids (1–6). 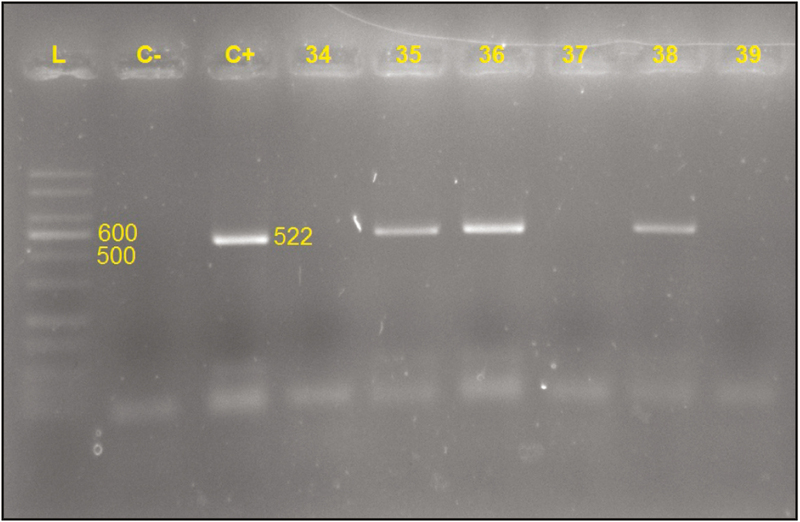 Results: Deoxycytidine kinase (dCK) (PDB: 1P60) was predicted as a potential target with fitting score of 5.574. In silico molecular docking of (1–6) into dCK revealed good interactions, where interesting hydrogen bonds were observed with the amino acid residues—Gly-28 and Ser-35—located in the highly conserved P-loop motif. This motif plays a special role in dCK function. Contrary to (1), in silico pharmacokinetic results have shown good absorption and permeation and thus good oral bioavailability for (2–6). Conclusion: The in silico docking data have proposed that the reported cytotoxic activity of the Amaryllidaceae alkaloids (1–6) could be mediated through dCK inhibition. 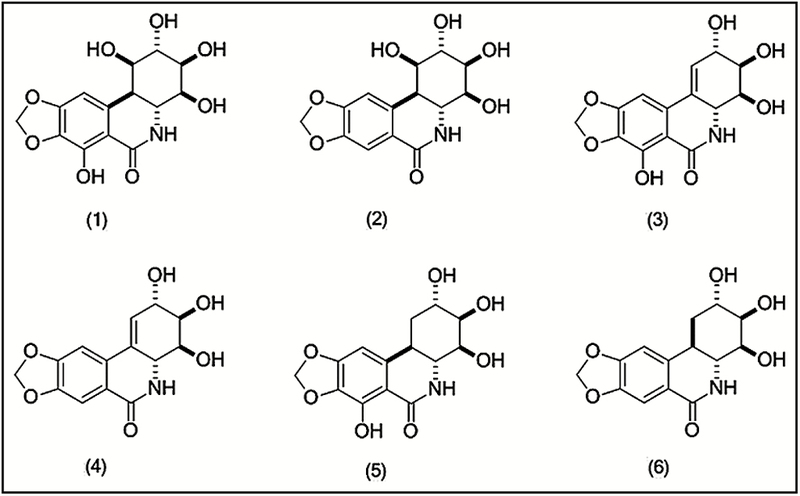 In addition, the ADMET profile of these alkaloids is promising and thus (1–6) could be candidates for future drug development. Introduction: Kushta of Shangarf (KS) is in therapeutic use since long time in Unani and Ayurvedic medicine. It requires extensive assessment with respect to its safety and processing because of the presence of mercury. KS prepared with Shangarf (HgS), Phitkari (alum), and Jozbua (Myristica fragrans Houtt.) was selected for the study. It is indicated as tonic, increases blood production, and improves complexion of face. Preparation of KS by classical and contemporary method and its comparative physicochemical analysis was attempted in this work. Materials and Methods: Kushta was prepared by incinerating the drugs kept inside Buta in Bhatti with 24kg of Uple (cow-dung cakes) and also in muffle furnace. 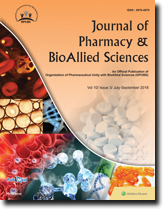 Samples obtained were evaluated by Unani specifications (test), powder characterizations, loss on drying, pH, ash value, solubility, particle size, and qualitative estimation of organic and inorganic constituents, X-ray diffraction (XRD), quantitative estimation by inductively coupled plasma–mass spectrometry and inductively coupled plasma–optical emission spectrometry, and so on. Results: Physicochemical standards set in were comparable in KS prepared by classical method (KSCM) and in KS prepared by muffle furnace method (KSMFM), except water-soluble ash and solubility in water were found slightly more in KSMFM. XRD study revealed the presence of aluminum oxide phase and absence of mercury in both the samples. Quantitative estimation of elements in both the samples in decreasing order are as follows: sulfur > aluminum > calcium > iron > arsenic. Arsenic was found more than iron in KSCM at parts per million level. Conclusion: Preliminary understanding suggests that muffle furnace method could be a better option with respect to safety and ease of preparation. 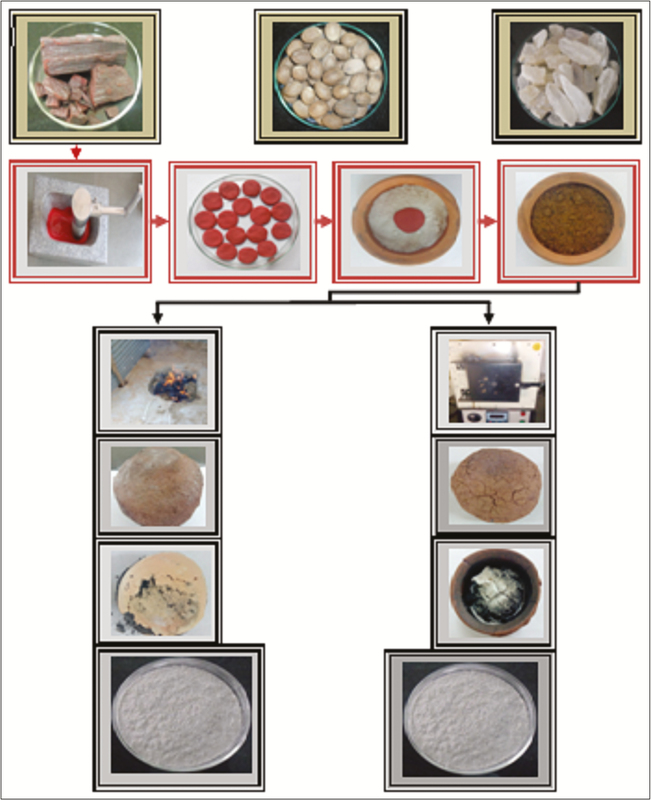 Shangarf incinerated above 900°C with Phitkari and Jaiphal did not show presence of mercury in both the samples, indicating KS prepared by incinerating at higher temperature can be safer than unroasted preparation. Studied formulation can be recommended or used for its indications without the concern of mercury toxicity. Background: Cinnamon (Cinnamomum zeylanicum) is a herb that is used traditionally as a flavoring agent as well as for its health benefits in different parts of the world. Its use may vary among cultures. Aim: To observe the knowledge and uses regarding cinnamon in the Saudi population. Materials and Methods: A 2-month cross-sectional study was conducted in Khobar, Saudi Arabia, using a novel questionnaire in Arabic language. Results: A total of 585 responses were collected. Most respondents were female (91.5%), adults (74.4%), married (65.6%), and had bachelor’s degree (58.1%). A total of 84.3% knew about cinnamon and used cinnamon as bark (38.6%) and as a flavoring agent (74.7%). Most common reason for use was to ease menstruation and menstrual pain (49.9%), as antidiabetic (35.9%), and for weight loss (5.6%). The source of information for cinnamon use and its knowledge was family and relatives who were using cinnamon (75.9%), that is, folkloric use. Conclusion: Folkloric use of cinnamon was found to influence the knowledge and usage of cinnamon in the Saudi population.